Earlier in the day I watched the US Men’s beach volleyball team get spanked by Latvia. At the beginning of the match, the announcers, one being my favorite volleyball player of all-time, Karch Kiraly, introduced the US team members like they were Gods walking onto the sand. “The Professor” and “The Thin Beast” are nicknames for Todd Rogers and Phil Dalhausser. Isn’t that slick. We love to do that in the U.S. I’m waiting for Michael Phelps to get the nickname of “The Fish” or “The Dolphin” or “The Undulator” or something ridiculous. I wonder how cool “The Professor” and “The Thin Beast” felt when two unknown guys threw sand in their face. Latvia is ranked 23rd of 24 teams! Latvia absolutely dominated the game. And so last night when Bob Costas previewed today’s coverage and began talking about “The Redeem Team” I had to turn off the television. 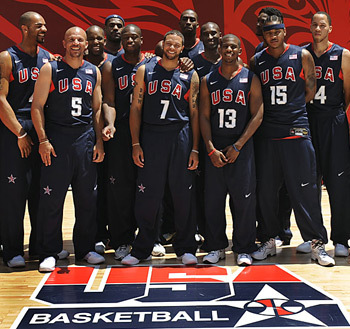 The Olympic hopes of the US are no more special or fantastic than that of any other country, team or athlete competing. We Americans are really not that cool, and I wish that we wouldn’t build ourselves up so much and play into the hype created by the media. You don’t see other countries coining catchy names for their athletes. Why do we feel so compelled to do so? Of course I am cheering for the US (and Japan when I can), but in some small way, I hope the “Redeem Team” is dealt a huge serving of humble pie. We might all get a taste. Maybe that would keep them (and us) from looking so stupid in the future. Or does our future hold a place for “The Supreme Team”? Blech. I hope not.